Poor Man’s Soup is a recipe that at its core is about stretching a grocery budget. But it’s also so delicious that it has remained on our meal plan rotation even as our grocery budget has grown. Here’s my take on stockpiling: If it is something that you will truly use–get it and save it, but only the amount you will actually use in a reasonable time-frame. If it is something that you can get for pennies that you probably won’t use–get it and donate it. But, here is where it really counts–in my opinion–when it comes to saving money at the grocery store: Buy produce that is in season and on sale. Get store circulars and buy meat, dairy, and other items when they are on sale. Shop around! Get the Sunday paper and look at grocery circulars! If you can save money by going to a couple different stores to do your weekly grocery shopping–do it. And here is another thing–take note of how much you waste. We’ve all done it from time to time…whether it is produce we buy with the best of intentions or the leftovers we think we’re going to eat, but don’t. So–shop from sales when you can. Use coupons if they are for products you already buy. And, only buy and cook what your family will actually eat. I’m still working on the last one. Poor Man’s Soup is delicious on its own, but when you add a yummy bread on the side–well, it’s phenomenal! Pair this delicious dish up with Copycat Macaroni Grill Rosemary Bread, Copycat Olive Garden Bread Sticks, Italian Chopped Salad, or finish your meal off with our budget friendly and somewhat healthy Fruit and Berry Kabobs with Homemade Hot Fudge Sauce. We love this Rosemary Bread. It’s one of our favorite breads to eat, whether we’re baking it up in our own kitchen or eating it at a restaurant. Soup recipes are easy to make, and they are even easier to eat. With soup, I’m talking about a meal that not only warms you from the inside, it warms your soul. And Poor Man’s Soup delivers. Soup is comfort food at its finest, and if you’ve strolled around All She Cooks for any length of time, you probably know that we are all about comfort food. If you take a look at our most popular recipes–comfort food. Pure and simple. 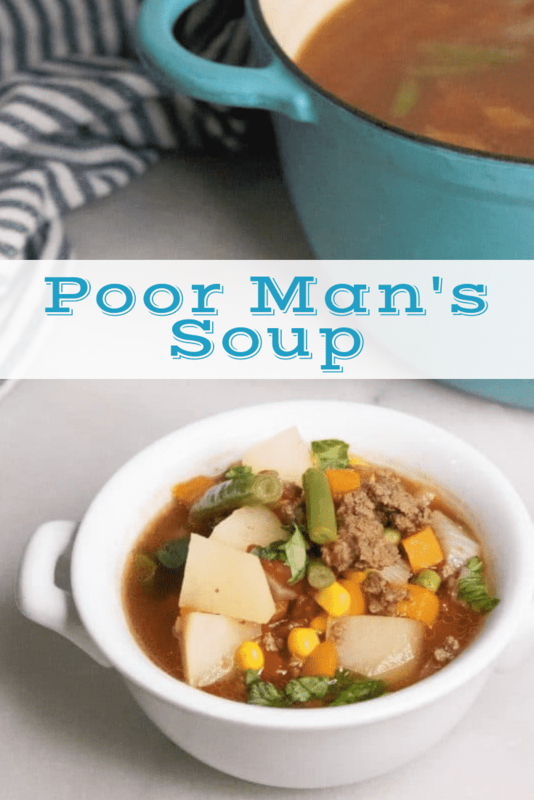 Poor Man’s Soup–Hey! That’s the post you’re already on! Best Chili Mac–Yum, Yum, and Yum! And Chili Mac n Cheese while we’re on a chili mac kick! Best Copycat Zuppa Toscana–Restaurant Quality and DELISH! Ground Beef Goulash–Easy Peasy Meal! Weight Watchers Banana Bread–Why Not? We’re talking about all kinds of good food! I don’t make Poor Man’s Soup nearly as often as I used to, but I love how easily I can pull a meal together with ingredients I have on hand. No need to run to the store for this recipe… if you don’t have one of the ingredients listed in the ingredients list, don’t be afraid to try something else. Adding a new ingredient can add both flavor and texture to a dish, making it something completely new! 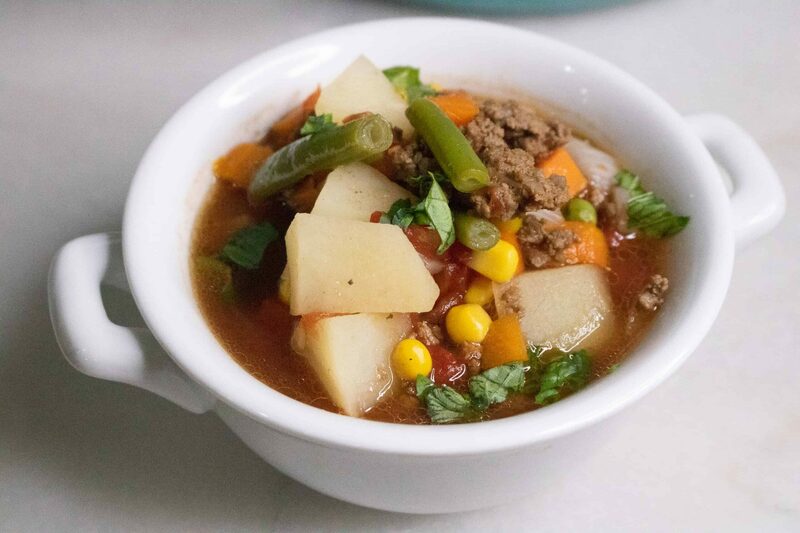 One of our readers tried this recipe and commented that they added kielbasa sausage and some different seasonings to the soup. I LOVE that–don’t be afraid to experiment with variations. If you want to get an idea of possible variations to try, check out the comment section to see what other people have tried. If you’d added something to this soup that you think is amazing–share it with us in the comments! I’d love to hear how you’ve adapted our Poor Man’s Soup recipe and I’m sure other readers would love to see your ideas as well. Want to learn how to make more soups from scratch? Here is a Simple Soups From Scratch e-course you can take! LOVED it! Making soup from scratch is a skill that gives and gives. Seriously. Once you learn how to make soup from scratch, you will not want to go back to serving soup from a can ever again. We’re talking about super fresh flavor, amazing ingredients, and the ability to seriously cater to your own tastes. I’m bringing it back–again–to the idea that if you don’t like a specific ingredient or flavor, substitute, substitute, substitute! This is a great tool to use. Once you figure out the basics of how to make soup…and you know the ingredients and flavors that you and your family like best, you are ready to start experimenting and creating soup recipes all on your own. Toss all of the ingredients into your slow cooker, after you’ve browned the meat and let it cook up all day long. You’ll be amazed at how delicious and filling a bowl of inexpensive ingredients can be. Inexpensive, and cleanup is a breeze if you use slow cooker liners like we do. And did I mention that Poor Man’s Soup is healthy? These colorful soup bowls with handles are on my wish list, and I’m hoping that the next time I make Poor Man’s Soup (or any other soup for that matter), I’ll be dishing it up in style. 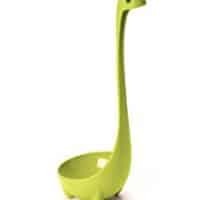 Not to mention the fun Dinosaur Soup Ladle that I saw ALL OVER the internet last holiday season. We’re talking about a great gift idea for the soup lover! If you want to make this soup even healthier, use lean beef or turkey and keep the salt to a minimum. I love using a combination of beef and turkey to maintain the beefy flavor but to still get the benefit from the lower fat in the turkey. Cutting calories where you can when trying to enjoy a lower fat diet is always a good thing. 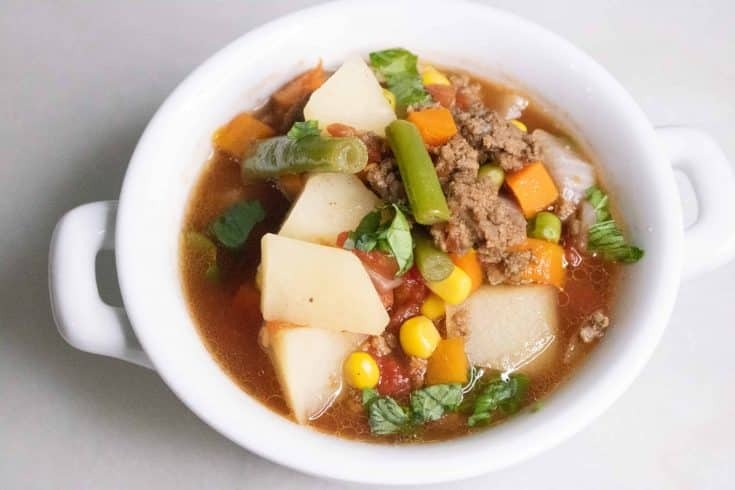 One of the things we love about Poor Man’s soup in particular is that it is loaded with vegetables. While it does have ground beef (or turkey!) in it, the amount per serving that you get really isn’t that much. Another great thing about this soup is that once it is ready to go in the slow cooker, it is perfect for serving to a crowd. No need to worry about dinner getting cold or food being left out too long since you can set it to keep warm. It also makes for great leftovers. And as we discussed before–make sure you are going to use the leftovers if you cook enough to have them! If this recipe makes too much for your family size, consider cutting the recipe in half. There is no shame in that. OR- if you are going to have more leftovers than you will use in 1-2 days, freeze a part of the leftovers. 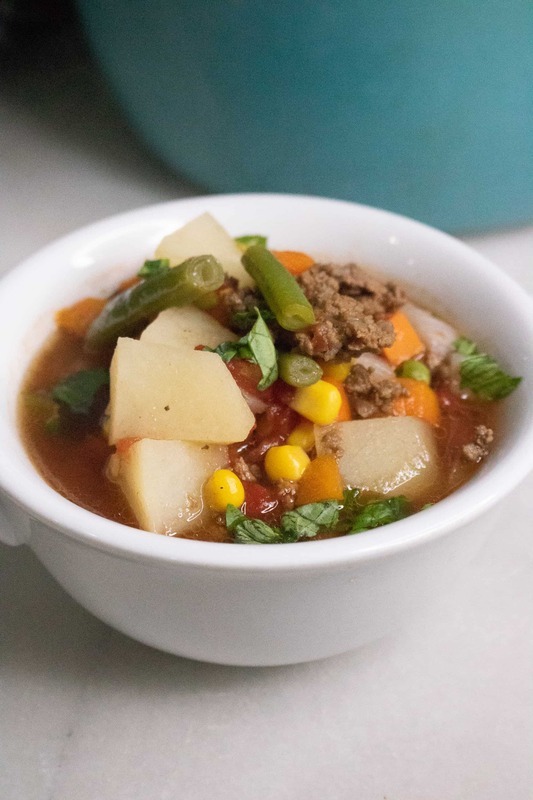 Just like our favorite chili recipe, this soup freezes well and reheats perfectly! What a great way to have a meal or two put up in the freezer for when you really don’t have the time or inclination to spend time in the kitchen. Because let’s face it…we all get busy soon or later. Want to learn how to make more soups from scratch? You’re in the right place! Like I mentioned before…cooking soup from scratch will open all kinds of doors for you. And while I am speaking metaphorically, the knowledge that you gain when you learn how to cook soup from scratch is HUGE. Case in point. My own experience cooking soup from scratch started when I watched my mother-in-law make her famous homemade broccoli soup. And, I say famous because this was the soup that I requested nearly every Thursday night that we went to their house while we still lived in Arkansas. I would watch her cook the soups, starting with melting butter and then adding flour to make a thick roux. Then, she’d add milk, chicken stock and later broccoli and cheese, and of course seasonings. The thing I learned that stuck with me and changed the way I cook was the basis of making a roux. It wasn’t something I’d experienced before because my own mom has always used cornstarch to thicken gravy. And it was always added later on in the process of cooking rather than at the beginning as a roux is done. Roux is typically made from equal parts of flour and fat by weight. The flour is added to the melted fat or oil on the stove top, blended until smooth, and cooked to the desired level of brownness. The knowledge of how to make a roux for gravy or soup has enabled me to comfortably create a variety of soup recipes using the same roux base. 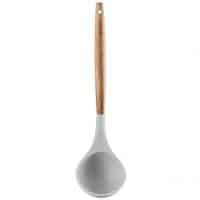 This is perfect for creamy soups. And creating new recipes by trial and error is always so much fun. Don’t forget dessert before you scroll on down to get our Poor Man’s Soup recipe! Now that you’ve got dinner covered, you’ll want to check out these delicious dessert recipes. They are amazing! And I’m not just saying that because I made these desserts in my own kitchen first. We’re pretty sure you’ll love our Hazelnut Cheesecake Icebox Cake. This is one recipe that I will make over and over again. It has a gentle coffee flavor that is perfect for coffee lovers and non-coffee lovers alike. I’m not a huge coffee drinker (seriously, I’ll order a Mocha from Starbucks and request half a shot of coffee instead of the full shot!) but I adore the flavor in this dessert. It’s delicious! Just look at the layers and layers of creamy goodness in the photo below and you will see what I’m talking about. This dessert is one that you’ll want to try. SO good!! Or try our Banana Cream Dessert. Again–this dessert has phenomenal flavor. If you like banana pudding, you will love this dessert, because it definitely has the same sort of taste to it. SO good. When I make desserts, especially during the summer months, I often stay away from baking. Everyone bakes. And–baking certainly has its place. However, I really think that there is so much more in the grand scheme of quick dessert recipes that can be created when you take baking out of the equation. Think no bake desserts. In this realm there are even cookies and bars like our delicious No Bake Chocolate Oatmeal cookies that are a family favorite. If you love those ingredients, you will love these cookies. Our Banana Cream Dessert is an easy layered dessert to make. Graham crackers, our secret concoction of yummy creamed layer, more graham crackers and repeat. Deliciousness. And now, because let’s face it–the reason you are here is to get our yummy Poor Man’s Soup recipe–is the recipe that you have been waiting for. It’s flavorful, delicious and SO amazingly easy to throw together. I’ve loved this recipe for years and have been making it with some consistency since my children were small. Reason #1: This soup is a budget friendly recipe. 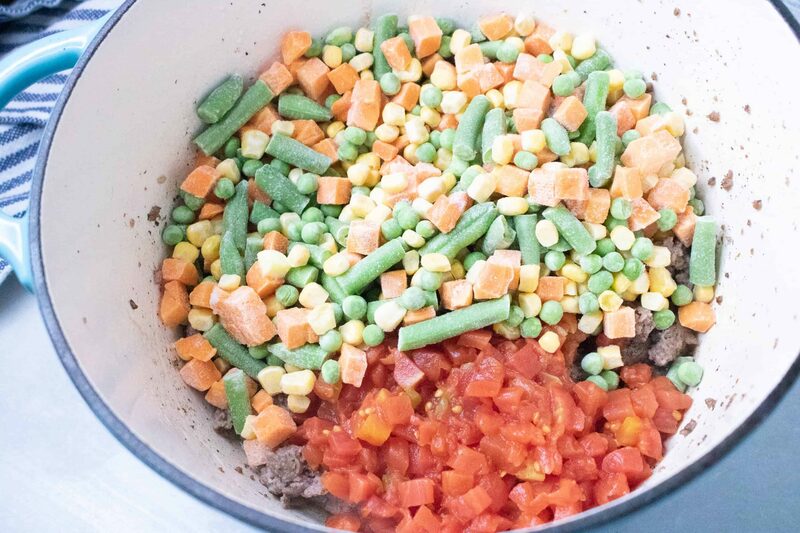 Both fresh or frozen vegetables work equally well in this recipe, so make it using the produce you have on-hand. I recently made a Mexican version using frozen corn, diced bell peppers and topped it with grated cheese and tortilla chips. Delicious! Reason #2: It is quick and easy to make. The soup comes together in just minutes, and then you simply can walk away while it simmers. If you use the slow cooker, it becomes a true set-it-and-forget it recipe! And since it freezes well, why not whip up an extra batch to stick it in the freezer? It’s always a relief to know you’ve got a meal ready to go “just in case”. Reason #3: You can customize it. As mentioned earlier, feel free to swap out the ground beef for turkey. Shredded chicken also works well. And for those who like to spice things up, try using hot Rotel instead of original. Or toss in some some extra peppers if you really like to bring the heat. Remember, a recipe is merely a starting point. Don’t be afraid to veer a little off-script. You know your own tastes and likes better than I do. 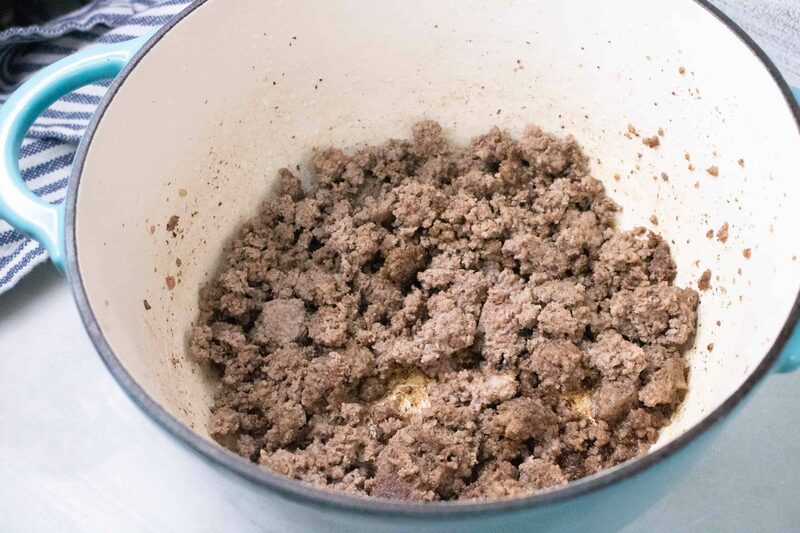 Step 1: Brown ground beef or ground turkey, drain and then return the the pot. Step 2: Add diced tomatoes with peppers and frozen vegetables. Step 3: Dice potatoes and onions and add them to the pot. Cover with beef broth or add beef bouillon and water. Step 4: Heat on stove top until lightly boiling and then reduce to a simmer and cook for 60 minutes. If you’d like more of a tomato flavor, add in a small can of tomato paste and stir. Don’t forget, come back and comment with your favorite variations of this recipe. We’re always excited to hear about what you’re trying in your kitchen! Poor Man's Soup is great budget-friendly meal that is full of hearty, satisfying flavors. Made with common pantry ingredients, it comes together easily and turns out perfect whether you use the stove top or slow cooker. You'll want to make this soup again and again! Brown meat on stove top and drain grease. Combine all ingredients, heat to a low boil and reduce heat to simmer for about an hour. Add salt and pepper to taste and dinner's served! If more of a tomato flavor is desired, add in tomato paste. This can also be prepared for the crockpot. Simply brown the beef or turkey and combine all ingredients in crockpot and cook on low for 6-8 hours. Fresh ingredients can also be used if you have them, and are so delish! Have you ever made this in the crock pot? Deidre- Yes. I have made this several times in the crockpot. Make sure to brown the meat before you put it in the crockpot and then throw everything in there. You might need to adjust the liquid since it will be cooking all day. I would probably cook it on low for 6 hours, but it would probably work on high for 3-4 hours as well. I always use the crockpot. I never knew it was Poor Man’s Soup. My daughter was a carnivore & would eat all the meat while it was cooking. So I started using ground meat, so she couldn’t pick it out. I don’t brown it first. I use V8(generally store brand) instead of water. I use a bit of green pepper also. You don’t taste it specifically, but it brings all the flavors together. 🙂 I still make this occasionally – not exactly the same but the basic ingredients are still there. Ah, I understand, we were stationed in Texas in the Air Force too! This sounds delicious. thanks! Our mom served this over mashed potatoes when we were young, back in the ’60s. Delicious! Do you cover this while cooking on low ? Have you ever used fresh vegetables instead of the other kind? Yes! You can use fresh, frozen or canned. I normally will use frozen because I buy them on sale and make local, fresh ingredients aren’t really in season. Have always ate and made this but this is the first time I have ever heard it called poor mans soup! I guess it’s because we never knew or think of ourselves as poor! This soup was easy and tasty. I added quite a lot of seasoning. I found the soup a bit liquidy. I will add a little less water next time. This recipe makes a large slow cooker full, which is great for freezing meals for later. Thanks for the recipe! Can you use canned diced potatoes instead? Would you adjust cooking time in crockpot? You certainly could, but I would wait to add them in for just the last hour in the crockpot so they can be heated but not mushy. For sure. That is a wonderful substitute. 1 cup broth would be the substitute for each bouillon cube, and then reduce the water by as much. We called it hobo stew. Always tastes better the second day. Is this easy to freeze? Yes it is. Freezes great. My grandma has made this for years. We add a little tomatoe paste. One of my favorites, so good! Thanks for posting. My mom has made poor man’s soup since the 60’s! (I grew up on it!) But she added a large bottle of tomato juice and a pinch of Tabasco flor flavor! Real good that way! And after it was cooked she added some spaghetti noodles! When the noodles were done it was time to eat! I still love it her way! Welcome to Yum Goggle! We are following you on all your social media and hope you will follow us back. We will try to tag you each time we promote your posts. Kelli at YG! Whats the best way to store this in the freezer? Can i make all of it in the crockpot and then store half in the freezer for later? Yes you can. I would use a freezer safe bowl. What type of potatoes? Russet? Those seem large to use 6-8 of them. Small russet potatoes. If you have larger russets, use 3-4. I use to cans of diced potatoes. Works out great. I love this soup. Ignore my first comment. I meant to say I use 2 cans of diced potatoes and it works out great. So much easier than peeling and chopping potatoes. Can you use red potatoes? For sure! You might need to adjust the cooking time a little, so just keep an eye on them so they don’t get mushy. I love red potatoes! 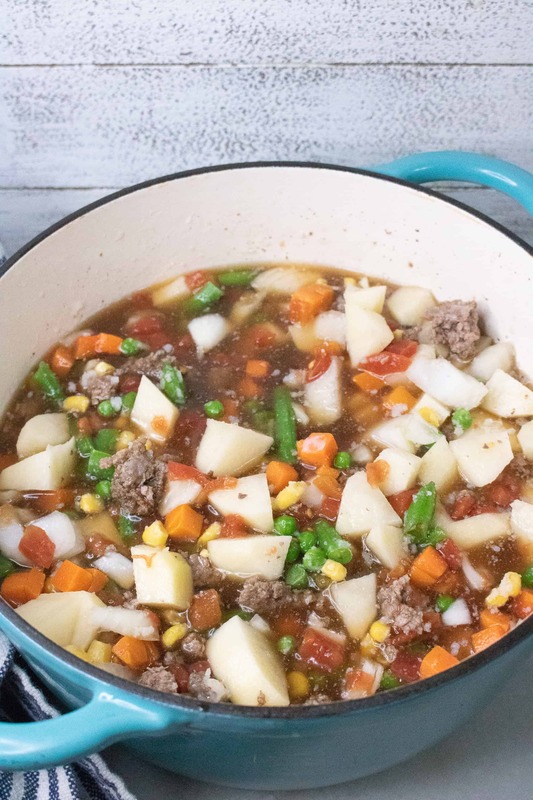 Instead of water, would beef or vegetable broth work? Or stock? Most definitely! You can also add in some tomato sauce if you’d like. So why cook it for 6hours in a crock pot when u can cook it for only 1hr on stove top? They all say everything’s better In a crockpot though.. Whichever you prefer to do, but I like making things in a slow cooker sometimes when I don’t have time to stand around in the kitchen checking on dinner, or better yet–I want it to be ready when I get home. I’ve made it both ways, stovetop and slowcooker. we weren’t a fan of it stovetop, I’m unsure why. But slow cooker is amazing and freezes so well! I dice up Redskin potatoes. They hold up better. I’ve made poor mans soup for a long time. but I put cabbage & noodles in mine. Try it, you”ll like it. So, where do the bullion cubes come into play? Mix the bullion cubes in with the ground beef after you’ve drained the grease from the ground beef. The first time I made this, I did it as the recipe and it was good but not awesome. This next time, I added only enough water to cover, added kielbasa, garlic powder, parsley, basil and oregano and it was awesome. All but 1 of us (8 total) went back for seconds and some went back for thirds. That sounds great! I love that recipes are so easily adaptable to your own tastes. My grandma always makes this since I can remember! I thought it was just called hamburger soup lol either way delicious!! I haven’t, but if you do I’d love to know how it turns out. Maybe a cup to a cup and a half? I made the soup a night ago is it ok to eat today it has been in fridge this would be day two ? Leftovers are typically good for a few days. In place of frozen veggies I have used the Large can ( 28 0z. )of The Veg-All mixed vegetables (can with the large veggies) and that way doesn’t have to cook as long; just heated through. I also use 1/2 ground beef and 1/2 Italian sausage; roughly 1 lb. each. I also mix everything together the day before – storing in refrigerator; and heating in crockpot the next day. Hi Dawn. The recipe makes enough for 8 servings, which is 295 calories each. The nutritional information is below the recipe at the end of the pots. Thanks! There is a classic story called “Stone Soup”. It is the Depressin Era whe =n people were struggling. As the story goes on, different people meet and bring one ingrediant, all the food they had. They start with a stoe and a pan of wate. Someone brngs a potato., another an onion, somone a carrot, etc, and put the all together tomake Stone Soup. My mother and grandmother made Poor Man’s Soup going back to the Depression or earlier. It is different frolm your recipe. I gathered it came from Tennessee where my grandmother was frolm, or Texas, where we all lived. Thye put a soupbone in a pan of water *or, in better timesm=, we started using beef stew meat.) Put it in a large pot on the stove to cook. 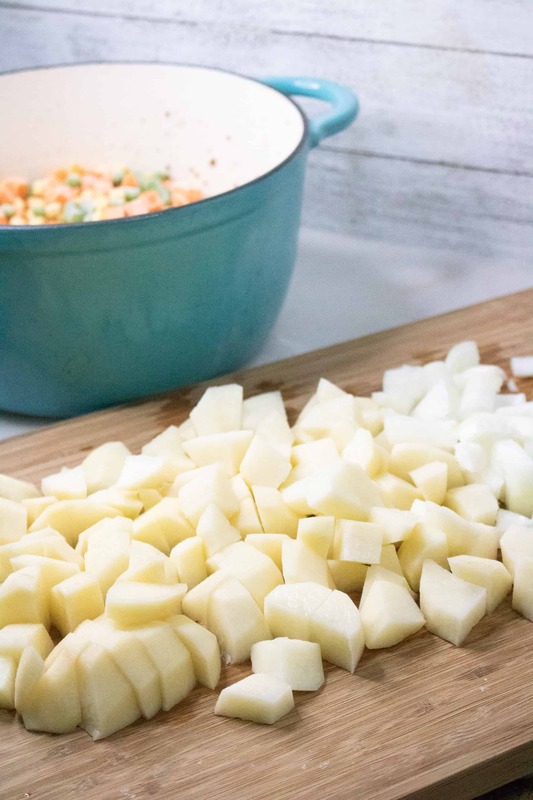 Added salt and pepper, diced onions, diced potatoes (Irish potatoes, but now we are using Russetts….whaever kind you like.) Add canned tomatoes, I like to use a large can. You can also add a diceed carrot. After that , add any ingrediants you like! Whatever you might have on hand. But this is the basic Poor Man’s Soup! Sometimesm I add tomato sauce, or tomato paste, or tomato juice, a dash of catsupm or a dash of Worchestershire Sauce, a can of tomato bisque soup, or Golden Mushroom Soup, or Cream of Mushroom Soup, or French Onion Soup, etc., little broiler onionsm, diced green pepper, a diced clove of grlic, dicec celery, a bag of frozen vegetables, the ones with the little broiler onios, carrots and celery, you could add fresh tomatoes diced, okra, fresh, frozen or annned corn, chicken or beef broth, etc. When I started adding thigs to the old ecipe, my dad said I had changed Poor Man’s Soup to Rich Man’s Soup! 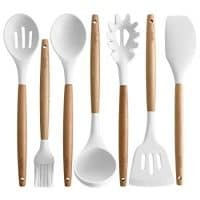 🙂 you can also add thhings like noodles or elbow macaroni, even pieces of biscuits to make dumplings. My daughter makes a bi pot of this and puts it into serving size containers in the freezer. So, whenever I want sme soup, I jut thaw a continer of soup in the microwave. I will comment that it doesn’t taste as good in the crockpot as it does on the stove top. Mine neveer came out the same as my mother’s Poor Man’s Soup. I watched and wrotedown, made it under her direction, but it still was not the same. She always said it was that the difference was in the wter!—Calveert water was the best! This soup is delicious! I added Rotel and green chilies to spice it up for my husband. Cornbread goes great with it. I am 85 Ihave made a soup like this for many years. I just called it hamburger soup. The veggies I use are carrots, celery, potatoes and onions. I then add whatever left over in the frig. I have used broccoli, peas, corn, squash. I add a can of pinto beans. I like a tomato base, if I don’t have home canned I use petite diced ones. I season with salt, pepper, parsley and Italian seasoning. I sometime add a little chili seasoning from a package, and a little hot sauce. Not enough to make it hot just a little warm. I add a pk of onion soup mix sometimes. I always use the better than bullion paste. Cornbread goes well with this. Made this for my lunch meal prep – DELICIOUS!!! Thinking of adding cauliflower next time!! Not precooked before it put in pot with all veggies. I recall celery, onions, Idaho potatoes no tomatoes sauce! I think adding spices makes it tastier. Reminds me of my Mom’s Friday night stew. All leftovers from the week in the fridge went into a pot before Dad and Mom went shopping. We couldn’t waste anything in our house. This is currently simmering away on my stove. It’s the second time I’ve made it and my hubby and I love it! I add a couple dashes of Worcestershire and about a tablespoon of extra better than bouillon beef. Delicious!! Thanks for an amazing recipe.